Saunas provide quite a lot of positivity. Hardly anyone would argue with that. As soon as you decide to get one for yourself, it is clear that you need to find out what sauna equipment is available in our online shop. So, what is available and what is necessary? 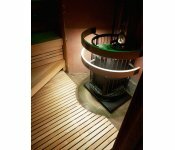 Sauna structure is simple – a small room, heated using a furnace. It is interesting to note that the very first saunas are not what we see now. Back in the day, they were deep pits in the ground, and even further back, it was a portable tent with a heated rock inside. Even though ancient saunas were primitive, they still did their job. These days, saunas are simple and complicated at the same time. It's a fact that sauna equipment has changed, and continues to evolve. First, it was a furnace, then a furnace with a chimney. Then, one room expanded into a few – one for changing, another for heating yourself, and one to wash the body. So, besides the furnace, you have ventilation equipment, steel chimneys, and even steam generators. After these things became part of the whole package, the possibilities of saunas increased. The hear of every sauna is its furnace. 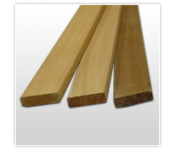 Manufacturers around the world offer all sorts of furnaces. You have a choice of electric, firewood, gas, infrared. Electric furnaces are quite common now. Nevertheless, some purists believe that nothing beats a good old-fashioned furnace that uses firewood. They believe that tradition is more important than modern technology. A lot of sauna enthusiasts rejoice with modern stuff. It means that it is not rare to find decorative lighting, sound, and even aromatherapy systems. It all comes down to the needs of the customers. 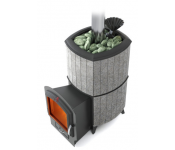 E-shop pirtiesprekes.lt has plenty of furnaces to offer. You can choose from the best manufacturers, such as Harvia, Helo, Iki, Tulikivi, Eos, and plenty others. No matter what you wish for, it will be available to you. Of course, it does not end with just the furnaces. You can get any equipment you want. Ventilation is a crucial part of the equation. Pros pay a lot of attention to it. If a sauna is built the way it should be, it provides a healthy and comfortable environment. Even after spending a lot of time inside, there are no headaches or other discomforts. It is all thanks to a proper ventilation system which has two functions – mixing air and providing fresh air. A ventilation system has to renew the air inside the sauna two to three times every hour. If you want to have the best possible experience, make sure that the ventilation system is right. Those with no experience will not be able to do it themselves. Therefore, it is the right choice to ask for professional help. Even those who do not frequent saunas know the importance of rocks. Of course, modern saunas are often without them. However, those who love traditions cannot imagine a sauna without rocks. You could gather plenty of rocks yourself out there, but it is not something that is recommended by professionals. Stones that you gather in nature can explode if they deal with too much heat. It is much better to purchase rocks in specialized stores. Why are rocks important? Well, they provide saunas with an important function – making steam whenever you pour water on them. 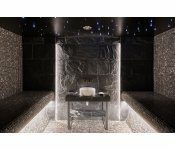 When choosing rocks for your sauna, pay attention to their size, type, price, etc. Electric furnaces are fine with smaller rocks (think five to seven centimeters in size), whereas firewood furnaces need bigger rocks – in a range of ten to fifteen centimeters in size. Place them so that bigger rocks are at the bottom and smaller ones are at the top. Rocks should be changed every year, though it depends on how often you use the sauna. Sauna doors are also important. They have more than one job. First of all, they ensure that the heat does not leave the room and act as a safety precaution (it opens to the outside so that whenever someone feels bad, they can leave the room with ease). The doors can be made of glass, wood, and are either single or double. These days, glass doors are becoming a staple. Before you buy the door, make sure that they can deal with temperature fluctuations. And of course, it is hard to imagine modern saunas without things like thermometers, hygrometers, skirting boards, headrest and backrests, mats, loungers, and so forth. Every little detail improves the atmosphere and provides more comfort.